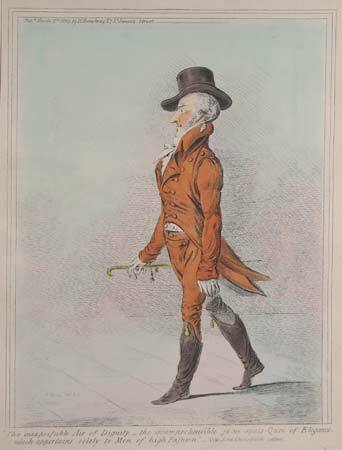 Caricature of the Duke of Marlborough. London, H.G.Bohn, 1851. A foppish Duke of Marlborough being contrasted with his warlike ancestor. Originally published 1803. London, H.G.Bohn, 1851. 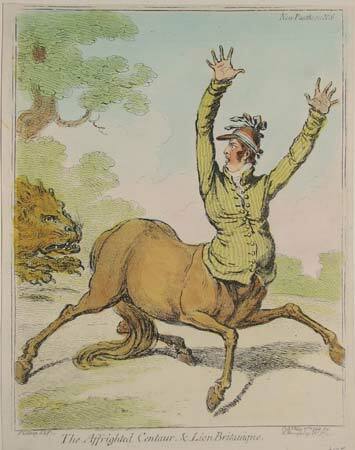 The Duke of Bedford as a centaur wearing racing colours, caricaturing his fondness for racing. Originally published 1799. London, H.G.Bohn, 1851. John Nicholls (1745?-1832), politician. Originally published 1799. London, H.G.Bohn, 1851. 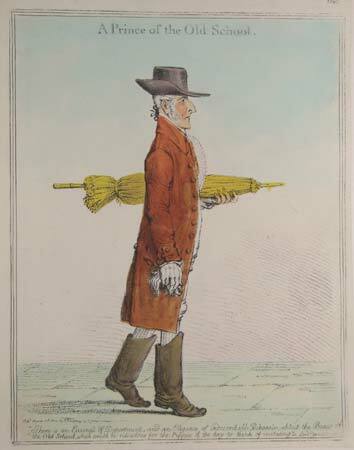 Boothby Clopton was a well-known eccentric, here shown carrying a large parasol. Having exhausting his fortune he shot himself. Originally published 1800. London, H.G.Bohn, 1851. 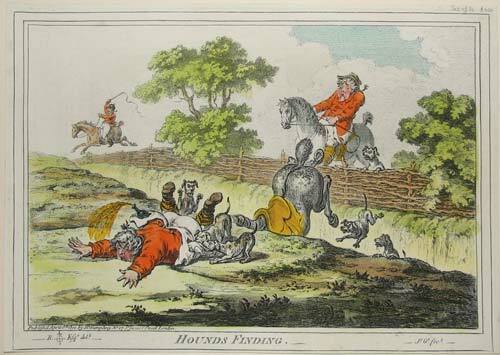 Decorative set of caricatures, with Gillray depicting inept huntsmen. First published 1800. London, H.G.Bohn, 1851. 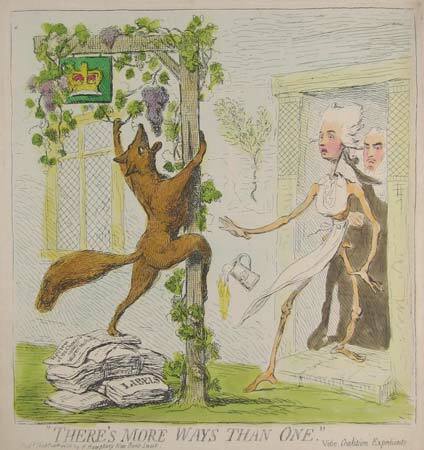 Charles James Fox is watched by Prime Minister William Pitt climbing on a pile of papers to reach the grapes of office. Among the papers is 'Review of the Charges against Warren Hastings', the first Governor-General of India. First published 1788. London, H.G.Bohn, 1851. An attempt to charge Sheridan with electoral corruption is 'blown out' of court. 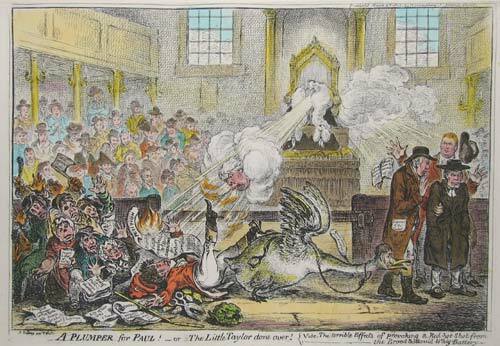 The goose is Sir Francis Burdett. First published 1807. London, H.G.Bohn, 1851. Elizabeth Gunning forged a letter to her father from the Duke of Marlborough, proporting his approval of her match with his son, the Marquis of Blandford. 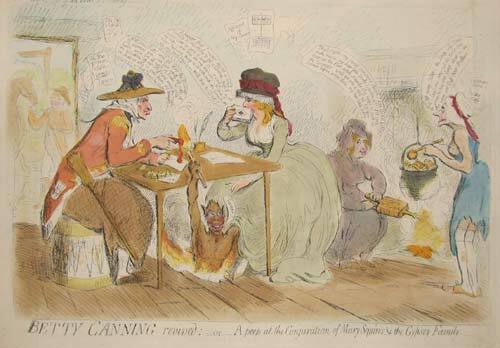 Having been discovered and ejected from her father's house, this satirises her attempts to deny the forgery, swearing an affidavit before a necromancer. 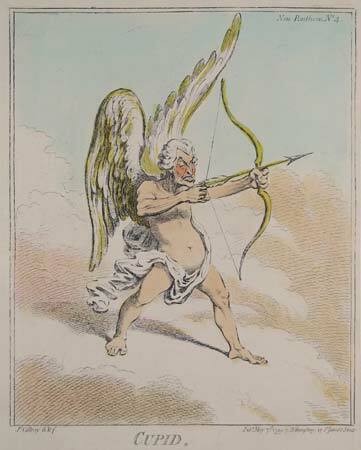 First published 1792.